Over the next couple of decades, three more ankylosaurid species would be identified from Alberta (besides Ankylosaurus): Anodontosaurus, Dyoplosaurus, and Scolosaurus. Anodontosaurus is known from a complete but somewhat squished skull and a half ring, Dyoplosaurus is known from an articulated pelvis and tail, plus hindlimb and other assorted bits, and Scolosaurus is known from an exquisitely preserved skeleton with in situ osteoderms and skin impressions, but without a skull or tail club. In the 1970s, Walter Coombs, Jr. undertook a large and important study of the ankylosaurian dinosaurs, which formed the foundation for many subsequent studies of ankylosaur anatomy and systematics. More specimens had been collected by that point, and subtle variations in the skull ornamentation among these specimens led Coombs to conclude that either every specimen must be its own distinct species, or they all represented the same species: Euoplocephalus (because it was named first). That’s a pretty reasonable conclusion to have drawn with the available evidence at the time. 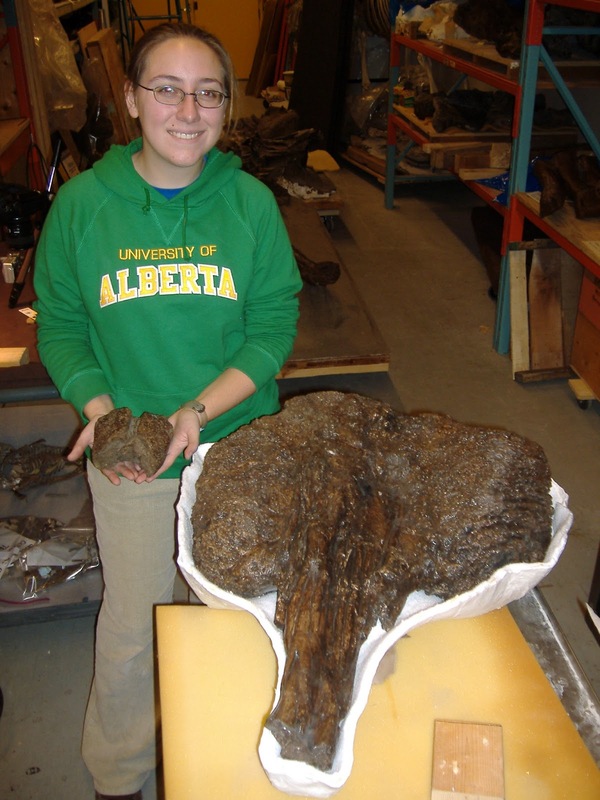 For my MSc thesis at the University of Alberta, I studied the biomechanics of tail clubbing in ankylosaurids, and specimens referred to Euoplocephalus formed an important part of that research. This is where I became interested in the variation that I saw in tail clubs referred to Euoplocephalus – some were small, some were large, some were skinny, some were round, some were pointy. What did it all mean? Were all of these the same species? Was I looking at ontogenetic changes? Were tail clubs just really variable in Euoplocephalus? What would this mean for how the tail clubs were used? Wow, 2007 was a long time ago. Anyway, here’s me at the Royal Ontario Museum holding the smallest tail club referred to Euoplocephalus, ROM 7761, and standing next to the largest, ROM 788. I CT scanned ROM 788 for my finite element analysis research, and you can now see it on display in the ROM’s dinosaur gallery. This was ultimately what led me to pursue my current line of research into ankylosaur systematics and evolution. I hoped that by understanding variation within Euoplocephalus, I would be better able to assess the validity of other ankylosaurid species, and perhaps identify new species. Over the next couple of posts, I’ll talk about how I did this study, and what makes a Euoplocephalus a Euoplocephalus. Stay tuned! The title for this post was shamelessly stolen from Collin Vanburen, because it is hilarious and perfect.